A stranded dog was rescued after being found swimming in the Gulf of Thailand – 210km from the shore. Workers onboard an oil rig noticed the animal’s head above the water as she paddled through the ocean last Friday. It’s understood the dog – named Boonrod (which means survivor) by her rescuers – fell from a fishing trawler, reports Bangkok Post. According to Metro, the offshore drillers called out to the mutt and she swam towards them. She took refuge among the rusty metal bars of the rig and the drillers used a rope to harness her and pull her to safety. She stayed on the drilling platform for two nights and staff looked after her, reports New York Post. 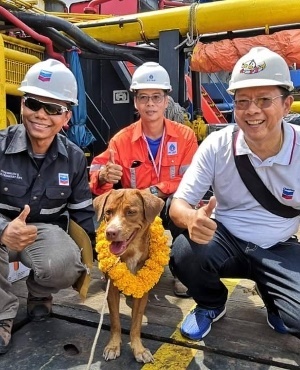 Boonrod was finally lifted by crane onto another oil vessel passing through the area on Sunday, which delivered her to a vet in southern Thailand on Monday. One of the oil rig workers who saved the animal, Khon Vitisak, says he wants to adopt her if no owner comes forward. “When we first took her onboard she was depressed and tired from being in the water for a long time,” Khon added.